Big impact can sometimes come from making the least impact. This is especially true in the case of mechanical engineering professor Eckhard Groll and his thermal systems research. Groll, who is personally and professionally focused on environmental issues, aims to create energy-efficient heat pumps and refrigeration systems that will have minimal impact on the environment. Eckhard Groll in his laboratory. 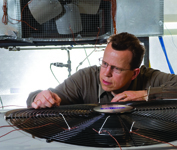 Groll works on design optimization and reliability studies for air conditioning, heating, cooling, and ventilation systems. His goal is to make individual components or entire systems more energy efficient. He does this, for example, by designing heat pumps and refrigeration systems that consume less energy because their on/off cycles are more sensitively tuned to operating conditions. His research has broad applications, from residential heating and cooling systems to commercial uses such as supermarket display case cooling loops and industrial uses in the chemical and food arenas. As a child in Germany, Groll followed his civil engineer father into the field as he worked on country roads and bridges. He was fascinated with machines, satisfying this interest first with a model railroad and later, as a teenager, by taking motorcycles and mopeds apart and rebuilding them. Then he studied the topic formally, intending to make a career out of building power plants. During his doctoral studies, however, he shifted gears from power production to power consumption and heat pump cycles. He wanted to learn how energy is used, instead of how it is produced. When Groll emerged from graduate school at the University of Hannover in 1994, energy issues weren’t in the spotlight. Now, nearly 15 years later, they are in the forefront of the public mind, especially issues related to energy production and consumption. The topic was explored this summer at Purdue during the 12th International Refrigeration and Air Conditioning Conference and the 19th International Compressor Engineering Conference. doctoral student Ian Bell. This is an alternative to the traditionally dominant air conditioning and refrigeration technology of vapor compression, and uses an alternative cycle technology that can provide cooling capacity. The system flexible with respect to the gas and liquid used, and can be charged with many different gases for environmentally friendly operation. Groll believes that improved technology is, however, only part of the energy solution. “We need a cultural change in addition to the technology change. It cannot just come from engineering,” he says.